If you're playing along at home, you may have noticed that I skipped the second suggestion for improving videos, Don't Zoom. That's because I think this is more important. We'll get to not zooming later. Another disclaimer – I receive no benefit from any of the product or companies mentioned in this post. When I tell you a product or company has been good to me, it's because it(they) have, not because I'm on the payroll (nor am I making any accusations that any other bloggers are on someone's payroll). Anyway... back to improving your videos. Repeat after me - I will not use my on-camera mic for anything other than general sound. I will not use my on-camera mic for interviews. I will not use my on-camera mic for short films. On-camera mics have one major drawback - they are too far from the sound source. Let's talk physics for a moment. There is a law in physics known as the "inverse square law." It has many different uses, but for our purposes in sound reproduction, it applies thusly: As the distance from a sound source is doubled, the acoustic energy is reduced by 1/2 (or 6 dB). So, let's say you have someone speaking on camera, and that person is 8 feet away. A mic right next to their mouth may receive a signal of, say 55 dBA SPL (normal talking). As the mic moves from 3 inches away to 6 inches away, the signal level drops by 1/2, or to 49 dB. When we get to 1 foot away, it's in half again, or 43 dB. At 2 feet it drops by half again, to 36 db. By the time we get to 8 feet (where the on-camera mic is), the once strong 55 dB signal is now down to 24 dB. Can an on-camera mic pick this up? Sure, but it will turn the gain up so much that it will also pick up everything else in the room that is at or above the signal level of the talent, including the sound of the tape transport in the camera! To paraphrase Alton Brown, that is not good sound. The answer, of course, is to get the mic closer to the sound source. If you can't get the camera to within 6 inches of the talent's face, you need a remote mic. You have several options here, as I mentioned in the previous post. You can use something as simple as a hand-held dynamic mic (like an SM 58) and use it like a television reporter. If you are going to do a lot of "reporter" type shots, the hands down way to go is a noise canceling mic like the EV 635 or it's shock mounted cousin, the RE50. Long favorites of ENG news crews, these mics will allow the talent to stand in the middle of a football stadium and will still deliver great sound of just the talent. If you want to be a little less obtrusive, you can use a shotgun mic (like the Audio Technica AT 853b), and either suspend it from the ceiling, a mic stand or a fishpole. A fish pole is an extendable aluminum or carbon fiber pole that is designed to be held overhead by another person, and allows the mic to be placed just out of the frame above or below the talent. If you plan on using the shotgun on a fishpole, make sure you use a shock mount. The purpose of a shock mount is to isolate the mic from the inevitable handling noises that a fish pole will cause. The shotgun on a fish pole gives you a lot of options if you have a second person to hold it. That person had better have strong arms though. I really like this option because the sound quality is generally pretty good, and it doesn't cost a fortune. I recently purchased a shotgun mic, shockmount and fish pole for our church and spent less than $300. Another option is a lavaliere mic, just like you would use on a pastor or speaker during service. 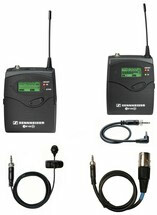 Ideally, you would use a wireless mic that has a camera mount reciever, such as the Sennheiser EW100 series. The wireless option gives you the most flexibility because you have no wires to connect you to the talent. As long as you stay in range, and choose a clear frequency, things work great. Be wary of cheapo wireless mics, however. If a camera mounted reciever and bodypack combo doesn't cost $400-500 at least, keep looking. You can also use a wired lavaliere mic. I have used these extensively professionally with great results. You don't have to worry about interference and the sound quality is excellent. 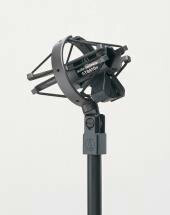 For wired mics, I really like Sony's ECM-77, though the ECM-66 and 55 are pretty good too. The 77 is great because it is tiny, can be hidden almost anywhere and sounds terrific. A final option is to use a wireless mic that you would use in a live sound application. I do this a lot at church because we don't have a camera mount wireless system yet. I'll just take one of our old Shure UT series mics, set the receiver on the floor next to my tripod, and strap the transmitter on the talent. It works great, though it is a bit of a pain every time I move the camera. All of the applications are assuming your camera has XLR inputs to work with (though the EW series also comes with an 1/8" cable). Each of these mics are professional grade solutions for prosumer cameras and above. If your camera has only a 1/8" mic jack, all is not lost. You might be tempted to make up an adapter to take XLR to 1/8". Don't do it. The pre-amps on consumer grade equipment will not function well with these types of microphones. The better solution is to use an adapter box made just for this purpose, such as the ones from BeachTek. They have a variety of solutions that include phantom power, metering and variable gain. They are well worth the investment (as low as $199). Finally, when you are recording, plug some headphones into the camera and listen to what you are recording. I am amazed and confused when I see people recording audio, but not monitoring it (and I've seen it with professionals as much as non-professionals!). When you listen in, you can hear trouble before it is too late. Make sure you use good headphones that provide good isolation. I've been burned before using cheap "walkman" type headphones and thinking I was hearing clean audio, when what I was really hearing was the person talking in the room. Hopefully you've found this helpful and you will be on your way to making better, more effective videos that will tell the story without being distracting.